When I wake up at 3 a.m. to go hunting the first thing I do is grab my Beretta A400 Xtreme and make my way over to the equipment corner.Now, I try to keep everything organized but for me that is a task that is flatout impossible. My mother once told me that if my head was not attached to myshoulders then I would find a way to lose it. Let’s face it I am a redneck. Notall rednecks lose everything but I mowed my yard last summer and found my boat. I find a way, half asleep, to get my feet in my Lacrosse waders and put my Realtree Max-4 on so that I can check out my blind bag andwhat is in it. Most of the time is empty nutty buddy wrappers and crackers.There should be however my duck or goose call and a box of shells that I amgoing to use. Did you know that over 80 percent of all waterfowl hunters pickthe wrong shells for the bird they are hunting? For instance I went earlyseason teal hunting with a man that used 2 shot and every time my dog broughtit back to me he would have to go back again to get the other half of the duck.Back in the day the old timers did not even know what non-toxic or steel shotwas. Today we have many selections. Picking a shot size on a shell has many factors. Am Ihunting in a field or timber? What size ducks am I shooting? How far will myshot be? This is why most shell boxes have selection guides on the box to helpyou. But if you are like me reading directions has never been a strong quality.That is why my kitchen table leans slightly to the front left and I had fourscrews and two brackets left over after putting it together. When I hunt small ducks like teal and wood ducks I liketo use 4 or 6 shot in my Beretta Xtreme. If I am hunting the “fat daddy” greenheads and similarsized ducks my favorite size is 3 shot. However, if I am hunting in a largefield unit I will occasionally use 2. Goose hunting, no question BB shot andeven then I have seen some Canadian Geese up north that I wish I had a deerslug in the chamber. In the coming days we will be talking a lot about duckhunting but until then feel free to contact me at my website www.hunters247waterfowl.com or follow me on Facebook. Again, if you have not shot the new Beretta A400 Xtreme you are simply missing out. It is the best waterfowl shotgun EVER made! As always another great article to read... Looking forward to the next one, keep up the good work. ok adam first i agree with the duck loads of 4 and 6 i usually out of my extrema 2 like hevi metal 3 they just pattern better then 6 shot or 4 shot. now I hunt a lot of canadas at my house in sask. and i gotta tell youB in hevi shot is flat out devastating. they are a little on the expensive side, however BBB in hevi metal will do the trick as well. 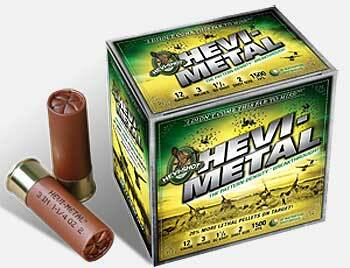 I do like hevi metal because of the mixture of number two hevi shot in the shell. It gives it that little bit of smack thats needed for those big honkers. I will do just that for you. I think the "move up a shot size" theory with steel is not necessarily the answer. I have had much better results on geese with 2's than with BBB's. I have been using Remington Hypervelocity 4's on ducks with good success, but I am considering going to 6's for a more even pattern. As of right now, I think velocity and pattern trumps larger shot. 2cents.